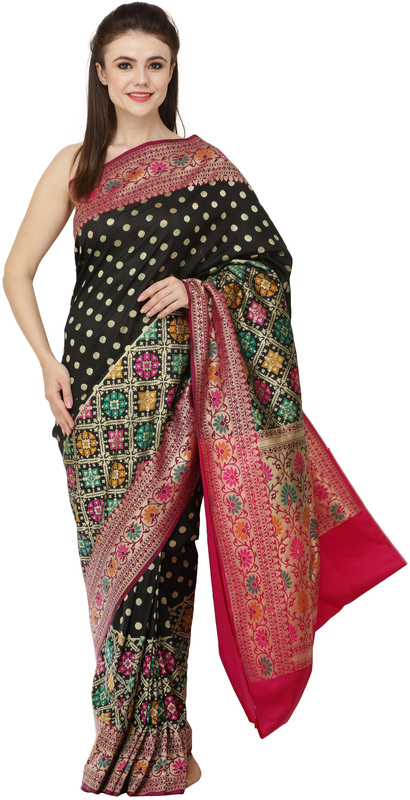 Every Indian woman should have a signature collection of Banarasi sarees in her wardrobe. This rustling silk number is just the right one to begin yours with, of course if your are yet to put one together. These highly characteristic figured silks emerge from the drawlooms of Varanasi and surrounding regions in Uttar Pradesh, at quite a distance from the foothills and into the lush North Indian plains. The weavers of the region, the Ansaris, have been working across generations with the finest of homegrown silks and cottons on their naksha drawlooms, which were brought to India in AD 900. It is since then that the resulting brocades have been the object of desire of women, and not only within the subcontinent. The motifs that make up the thick border of this Banarasi saree clearly draw form Mughal aesthetics. Ample florals and foliage have been intricately entwined on the pale pink of the foundation silk, with pastel-coloured threads from medium-sized to the finest available in the market. Across the solid-coloured field of the saree is a plethora of gold booties, woven into the fabric with a finesse that could only be found in the work of the Banarasi weaver. Note the way the soft pink of the border transitions into a richer gradient at the pale gold endpiece. This is just the saree to wear to an evening wedding ritual teamed with some statement jewels from your collection.